It’s imaginable Korean industrial designer Do Kyoung Lee’s technological design was born as a playful conceptualization of contrasts: a hard drive finished with a soft exterior case. Whether purposefully conceived or not with such wordplay in mind, the forgivingly pliant vented exterior of the Stripe portable hard drive serves a very practical purpose, able to withstand the shock of a drop without damaging the mechanism within. The Stripe’s drop-resistant case proposes a travel-friendly design able to withstand the rigors of a device intended to be thrown into a backpack with regularity. Forgoing rigid plastic or metal, the Stripe’s exterior is completely encased in pliant rubber, finished in a trio of fashionable terrazzo-like colors, resulting in a strikingly graphic form that more notably permits the 1-terabyte drive’s corners to bend and absorb shock when accidentally dropped. 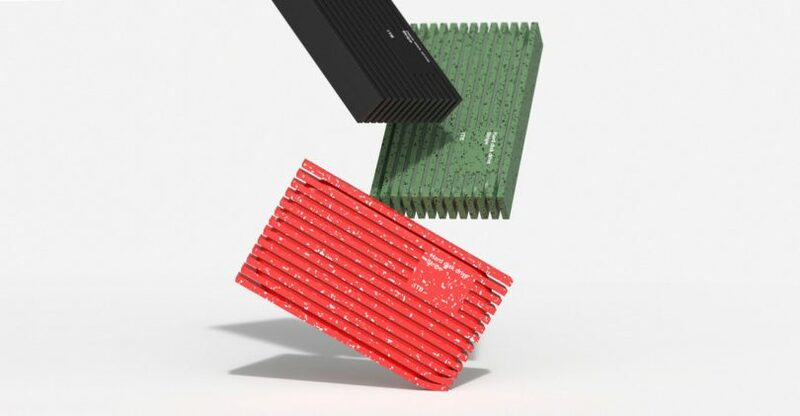 The vented design also evokes the shape of a plate fin heat sink, though the nature of the material does not afford the design any of the conduction heat transfer benefits of a copper or aluminum case (a limited edition metallic external drive by Philippe Starck for LaCie executed this in striking fashion back in 2013). A coordinating micro-USB 3.0 cable offers power and data connection.